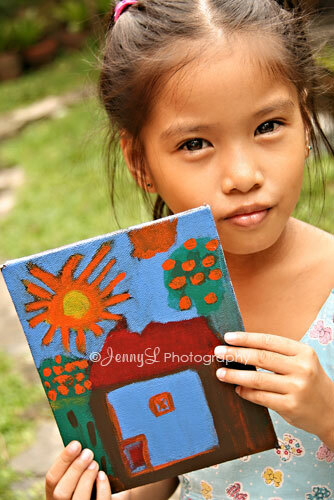 Here's my 6 yr-old niece Reign who loves to explore her creativity by drawing. She started early at 2 years old and we are not wondering where she got her talent bec. her dad was doodling at age 2 too. 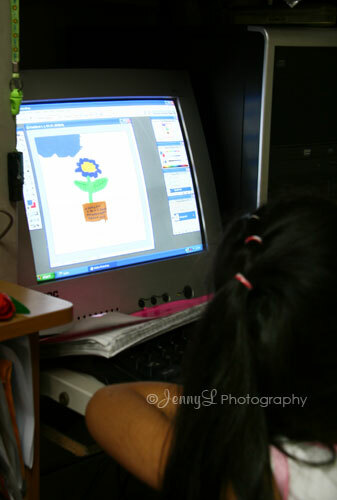 On the 1st photo she was drawing a flower using the Photoshop. She just saw the program one time and asked me where she can draw and showed her the brushes and colors and gosh I was amazed when I saw her draw this flower there. I guess if she can explore more and when she grows up she I know she can even make angel baby shower invitations or thank you cards like what I am doing too using the computer. Anyway, on the right side is her very 1ST drawing on CANVASS and we are so happy about it that her mom saved it for framing. She is talented, she can draw on paper using colored pens, pencil, crayons, use the computer and now canvas. I hope she can make beautiful art works in the future.